Home / Archive by Category "Oak Timber"
Solid Oak Timber Versus Engineered Oak Flooring – Which Is Better? Wooden flooring is a highly attractive addition to any home, but there is always the question as to which is the most suitable type of wooden flooring for the property. Oak floorboards are considered one of the best options because they are the most aesthetically pleasing; however, should you opt for solid oak timber or for engineered oak flooring? Many people believe that engineered oak floorboards are the same as laminate flooring, but this is not true. In fact, high quality engineered oak flooring has many of the same qualities as a solid oak; so, what is the difference? This article will provide information on which would be better for the property when choosing the best oak flooring for your home. 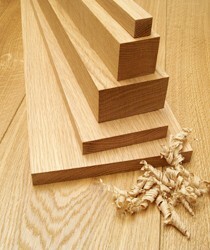 Firstly, a solid oak timber board is a natural product. This means that the wood will alter according to different climatic conditions, such as moisture and humidity or damp and heat. The susceptibility to changes in the climate is due to the fact that solid oak boards are semi-porous. In moist weather, the board will swell and it is important that the floorboards, when laid, are placed in a way where they are allowed to expand. If a gap is not permitted when laying the floor and the boards do swell, the flooring will most often buckle up in the center of the floor and not lay flat. As an example, let us assume that your room is 5 meters wide and you opt for a 170 mm wide oak floorboard to cover the width. This will mean that you need to lay thirty rows of oak floorboards. If each of the boards swells by 2 mm it could result in an overall swelling of 60 mm; therefore, you must allow for an expansion gap of approximately 20 mm which could be covered using a trim or skirting. If the sub floor was still drying out in warm situations, the flooring may trap moisture underneath it and cause damage to the floorboards. In all cases where original oak boards are used, the property should be dry after renovation work. When opting for engineered oak flooring, you will be using material that has a layer of solid oak glued onto multi-laminate plywood. Each layer of oak is glued in opposite directions producing a plywood structure that is highly stable and resistant to climatic movement. It is as beautiful as the natural wood option with the natural grain and figuring, but it does not present with the problems of a solid oak floor.